There is something about a seller who parks his bikes in the living room that makes you feel somewhat guilty about parking your bike in “just” a garage. This is one of those sellers. And note that we are not talking about one bike in the house – we are talking several! What’s better than a bike that is garaged? How about one that has been housebroken! 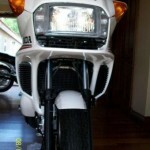 When Honda first introduce the CX500T in 1982, it was a technology wonder and a dog all at the same time. It was heavy and very complex. Boost was a double-edged sword: off boost the bike was a dog, and the transition to on-boost was harsh, sudden and potentially dangerous. Still, when the turbo was spinning the rider was grinning. 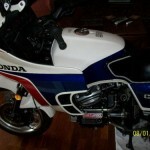 The next year Honda introduced the CX650T, which featured several improvments. 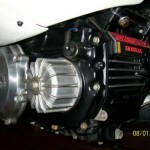 The larger displacement made the bike easier to ride off boost. 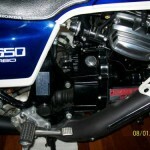 The transition from off boost to on-boost was improved, as was the general rideability of the bike. The color was also changed, and was now decked out in a fanciful red/white/blue scheme instead of the 500cc bike’s white/black/day glow orange. VERY VERY RARE in this condition. Restored by GREG GOSS RESTORATIONS. Three of Greg’s bikes are in Museums. Greg lives and breathes turbo restorations. 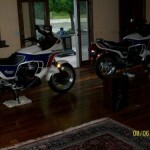 The bikes are ART displayed proudly in his home. Look at the pictures of restored parts on his living room table and spare room floors. 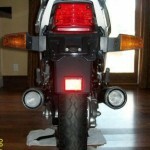 Bikes and parts in all stages of restorations. 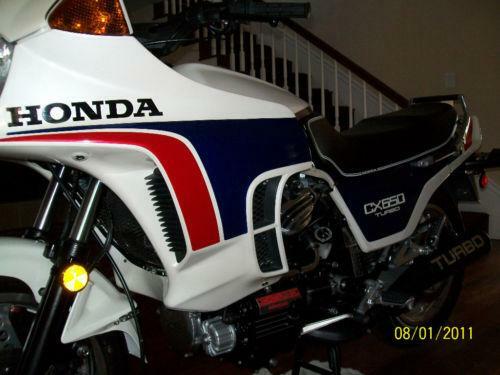 Greg Restores CBX’s, Honda dreams and all other custom motorcycle work (paint or fabrication). 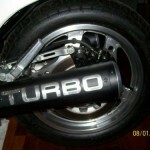 There are 3 Turbos currently in Gregs living room. The 56 mile bike, and customers bikes with 3000 miles and 8000 miles. You cannot tell the difference between them in quality other than the speedometer. The CX650T is well known as being the roll-on king. What does that mean? Simply that at any reasonable cruising speed (in top gear), whack the throttle open and this bike will out accelerate practically anything else on the planet. Sure, there will be a small amount of lag as boost builds (it really depends upon the starting RPM), but you would be amazed at how hard a 650 can pull. 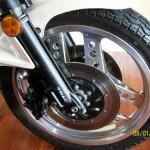 Although this bike is a 1983 model, it will easily hold its own with current machinery. 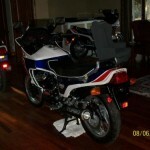 The asking price for this bike – which has only 56 miles and looks amazing – is an astronomical $12,000 (or best offer). These Turbos are certainly turning into collector items, as both the 500cc and 650cc variants were one year only bikes. Numbers are extremely limited as new bikes did not sell due to the high cost. Still, $12k would set some sort of record for one of these machines with average selling prices in the $5,000 – $7,000 range. Check out all of the information and pictures by clicking on the link. Browse through all of the pictures of this wonderful bike, and let us know what you think. 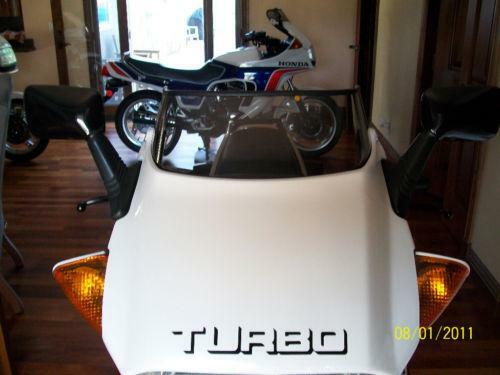 Good luck to the seller, and congratulations to the next owner of this techno machine! 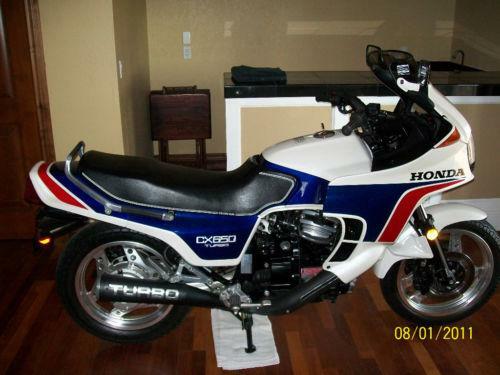 Next story Brand New: 1979 Yamaha RD 400 Daytona Special with 1 mile!